The Social Services Administration Building at the University of Chicago, designed by the office of Mies van der Rohe and opened in 1965, will soon be restored and renovated. Though not a Mies masterpiece a’ la Crown Hall, the SSA building has served the school well and is certainly worth maintaining. in Chicago on South Michigan Avenue, overlooking Grant Park. a facade like the facets of a diamond. Some say it protrudes too far out from the historic steetwall. 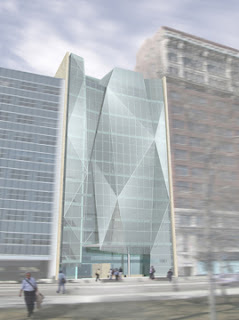 Especially since it’s in glass, rather than stone as the other buildings are on South Michigan Avenue. Here’s what you see from a balcony on 10. Also on this floor – the Board Room and Sky Garden. Above this, greatly pleasing the Mayor, a green roof. The glass (American-made), has markings which purposely make it less than completely transparent. Glass on the left, no glass on the right. I’m curious how transparent it will look when it’s finished, washed and the protective coating removed. And the 400-seat theater space looks large and promising, a two story space. 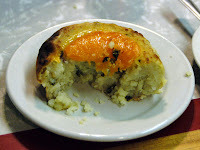 kosher knish downtown, you’ll know where to find it. (Though Wolfgang makes it a little different than they did in the shtetl.) A kosher cafe by Wolfgang Puck, on the second floor, overlooking the park at tree top level. This new $55 million Spertus Institute of Jewish Studies is set to open on November 30, 2007. They’ll host a week-long public celebration with tours, music and more. No full review of the building from me until it’s complete and occupied. But now you have today’s photos. I’m hungry, how about you? Spertus President Howard Sulkin wanted a home for this multi-faceted institution that would be open, transparent and dynamic; and he’s getting it. He should be commended for building a downtown Jewish institution that projects not fear, but optimism, enlightenment, joy, culture and learning. The building also expresses assimilation. The glass should make everyone feel welcome, and through the glass all visitors will feel still connected to the city, to the park, to Michigan Avenue, to Soldier Field, Lake Michigan and the midwestern sky. It’s an intimate connection I felt today, looking from Spertus to the rest of my town. And I saw the city anew, from fresh angles, which is the mark of a great city, to be able to offer new perspectives, on itself, and on life. Later today I’ll try to post, with photos, on the new Spertus Institute of Jewish Studies, designed by Ron Krueck and Mark Sexton. 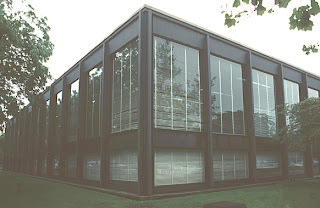 We will restore Mies’ 860-880 Lake Shore Drive Apartments! The finest, most poetic, most philosophical and aesthetically thrilling high-rise in the land. I told you about the restoration plans here. Now the board of trustees has passed the 7+ million dollar capital improvement plan. Thanks to Marc Boxerman, a trustee, and Don Hunt, a trustee, for their good work, and the others too. Next we must choose the right restoration architect(s). Krueck and Sexton (scroll down) / Gunny Harboe? John Vinci? And I’m a little sad that they’ll probably have to rip up the travertine in the lobbies. To get at leaky pipes underneath. That’s the original travertine and it feels it. Replacement is never the same. Stone, with its graining and the way it wears, gives off an energy doesn’t it? It tells a tale (and travertine knows stories all the way back to ancient Rome.) Our lobby feels more authentic than does, for example, the reconstruction of Mies’ Barcelona Pavilion. But the travertine on the south porch of Crown Hall was redone and it feels and looks good, the Farnsworth House has been heavily restored after floods, and it feels and looks good; so it can be done, if the right person is doing it, with care. That here is our next charge. And I’m excited to move forward with this. You are currently browsing the archives for the Krueck and Sexton category.